Well, it looked promising. Huge cast filled with comedy heavy weights and movie superstars - and a funny trailer. But, Movie 43 was seriously the worst movie Jesse and I have seen in years! We spent the entire time cringing - and I personally had to spend plenty of time willing myself not to gag. It was bad. We headed to the cinemas this morning for something different - I played hookey from work to spend some quality time with my man! Though... now we're wishing we chose a different movie! Movie 43 looked like a lighthearted funny film that would be good for a few laughs - but the only laughs were those... oh my god this is disgustingly terrible - how do they come up with this?! kind of laughs. We were also the only ones in the whole entire cinema (benefit of seeing a movie at 10am on a Monday! You're either sharing the movie theatre with a couple of seniors or no one at all) which was good because we were able to comment to one another just to check the person we're marrying isn't some sicko and actually enjoying the movie, haha. 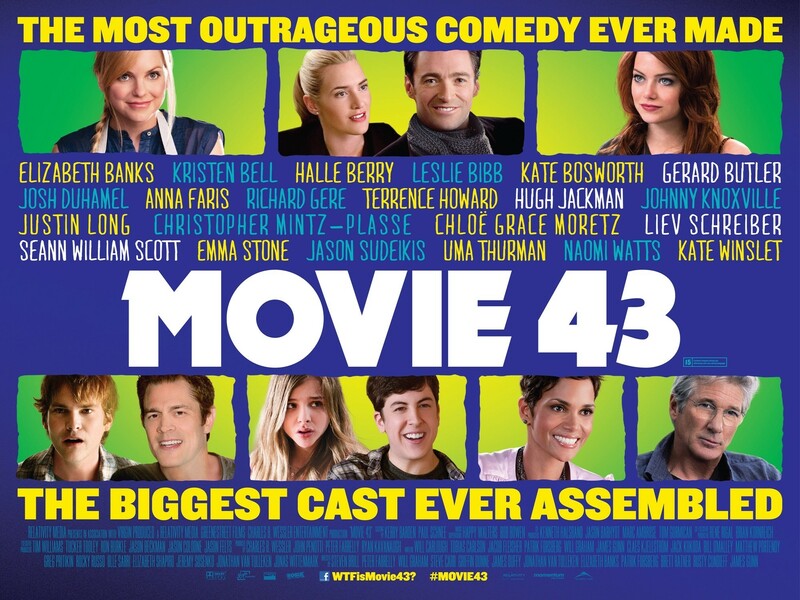 I guess, to enjoy Movie 43 - you'd have to have a seriously sick sense of humour. Now, I'm very much a conservative person - but honestly, I do laugh at disgusting jokes too - but Movie 43 went waaaaaaaaaaaay too far. Even for Jesse's boyish, immature, poop-joke-loving sense of humour. About half an hour into the movie, we contemplated walking out - but stayed because we hoped it would've got better (and duh, we paid to see a movie!) - unfortunately not! So tell me, what was the last movie you saw? How was it? I'm definitely open to recommendations of good movies to make up for this! I'm not surprised. I heard a review of this movie and it was described as "the worst movie ever made"! If you haven't already seen it, I recommend The Vow. With the kids I saw Hotel Transylvania. Was okay, for a kids's movie. The last movie I watched on my own was here at home - Young Frankenstein. It's from the 60s or 70s, but it's hilarious and I love it! I watched Hotel Translyvania, it was quite cute! Young Frankenstein sounds like something my sister would like - is it supposed to be funny? Yes, it's a comedy! It's got Gene Wilder, Marty Feldman, Cloris Leachman, Teri Garr and Ray's dad from Everybody Loves Raymond (can't think of his name at the moment!). It's got a skeleton scene at the beginning that is a little scary, and there are sexual references, but it's a fave of mine and my parents for years. That sounds fun! I'm going to have to find it at the video store or something and watch it! Er, I didn't mean to type kids's! Despicable me is a great kids movie! Oh this was a million times worse than Valentine's Day and New Years Eve - haha! Ah, I've seen previews for that movie and it looks good!